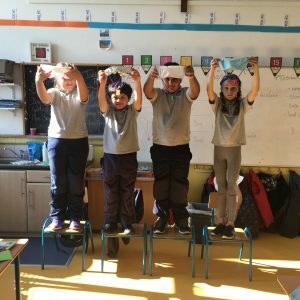 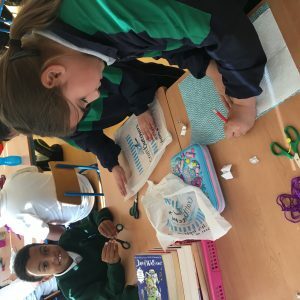 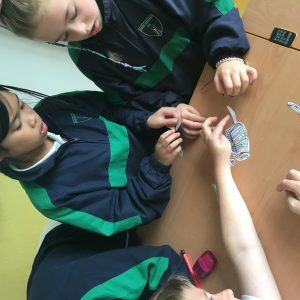 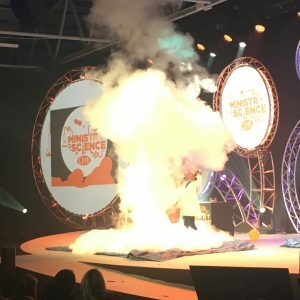 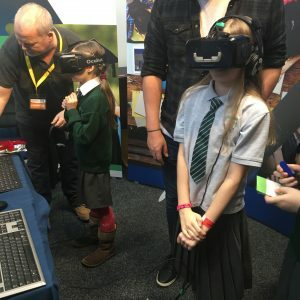 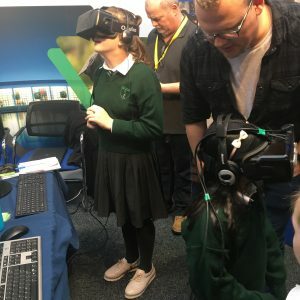 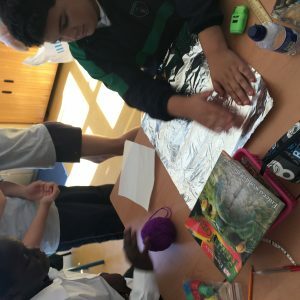 Welcome to the Good Shepherd National Schools Science Blog! 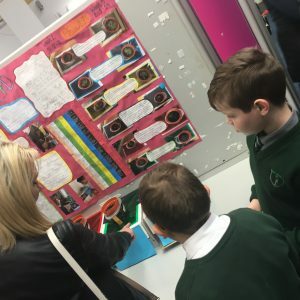 Here students in all classes at the Good Shepherd will record the different Science projects they engage with at school. 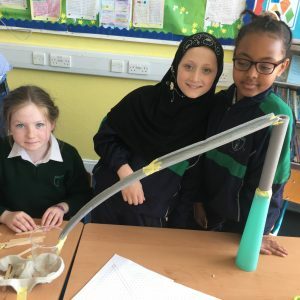 4th Class were learning all about Leonardo DaVinci’s inventions, one that caught their eye was the parachute. 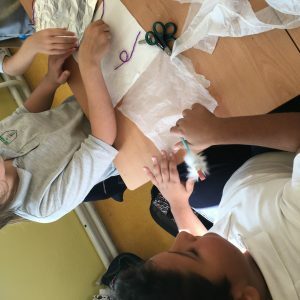 They then decided to make their own parachutes. 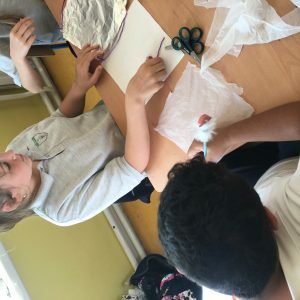 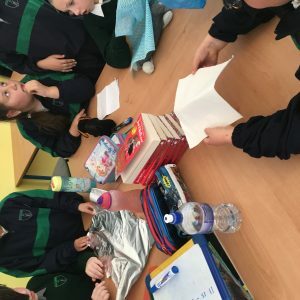 4th class tried to figure out what material would make the best parachute; j-cloth, tin foil, plastic or paper towel. 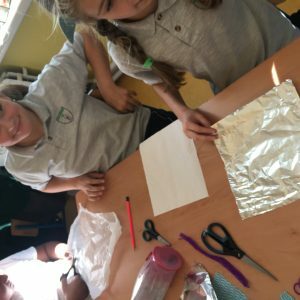 12 children in the class predicted that the plastic parachute would be the best, 1 person thought it would be the tinfoil, 4 thought it would be the paper towel but no one thought it would be the j-cloth (because of the holes!!). 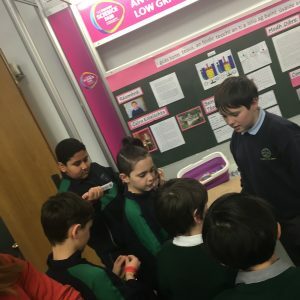 Trial runs have been carried out, make your predictions and stay tuned for final results! 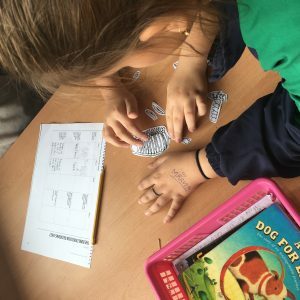 This week fourth class were working as palaeontologists to try and identify what animal these bones could belong to. 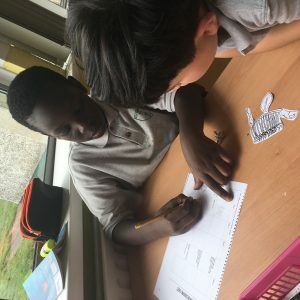 All of the groups came up with different animals, but some of the bones didn’t quite fit their theories! 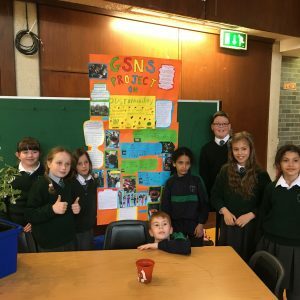 Congratulations to a group of 4th class students who were awarded a plaque for the school for their work on sustainability. 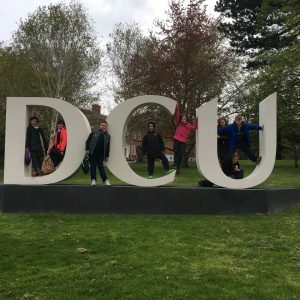 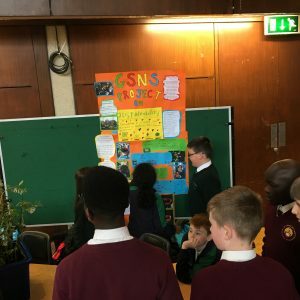 GSNS were very lucky to have taken part in a pilot scheme along with DCU and the Global Consortium for Sustainability Outcomes. 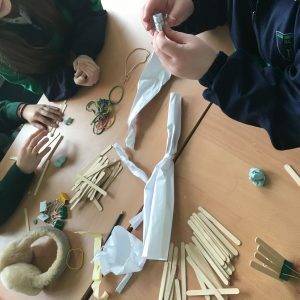 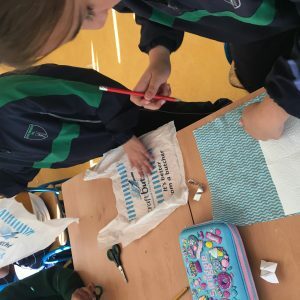 This fourth class group have been looking at sustainability for a number of months; where our food and clothes come from, what happens objects when we are finished using them and the effect our carbon footprint has on the planet. 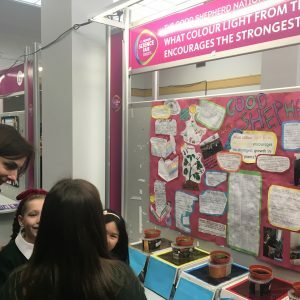 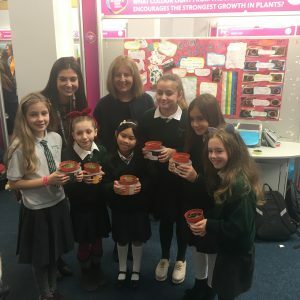 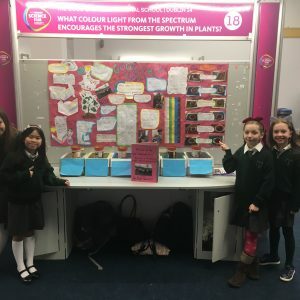 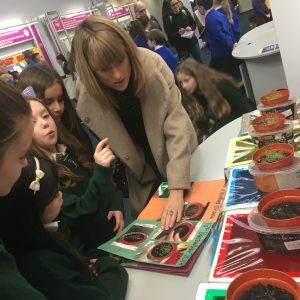 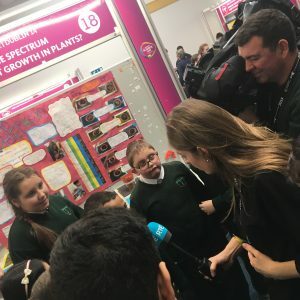 For their project fourth class decided to plant and grow vegetables that could be eaten by them and the rest of the school, in an effort to reduce their carbon emissions and learn a skill that promotes a sustainable lifestyle. 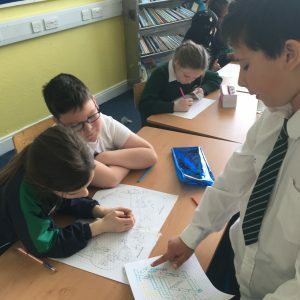 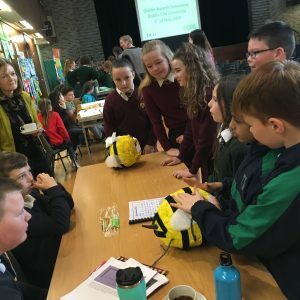 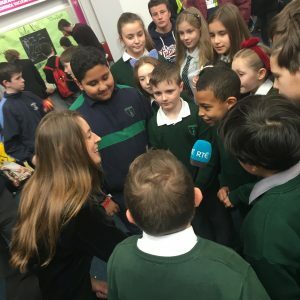 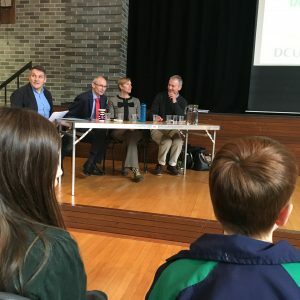 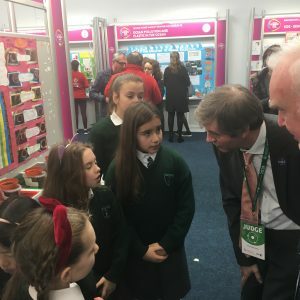 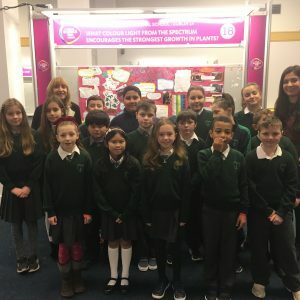 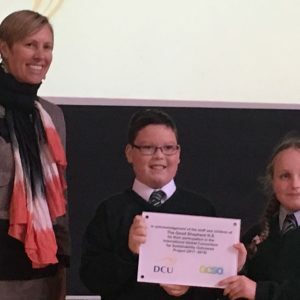 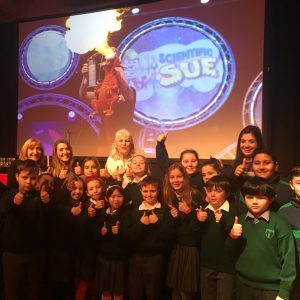 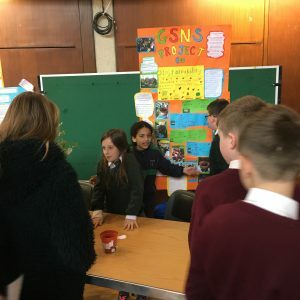 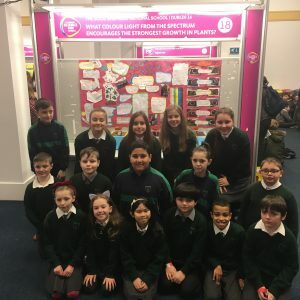 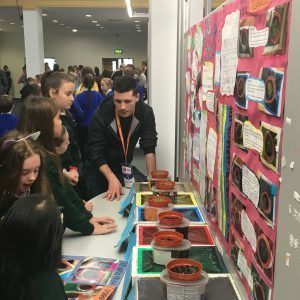 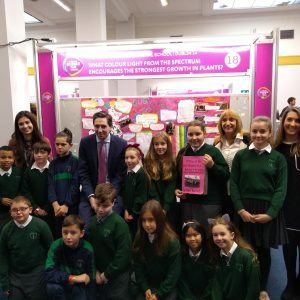 Fourth class were then invited to DCU to present their projects to the Science Education staff and seven other pilot schools. 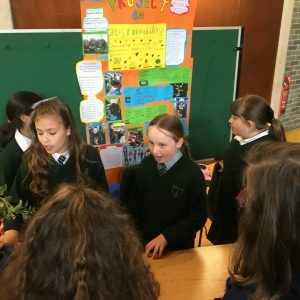 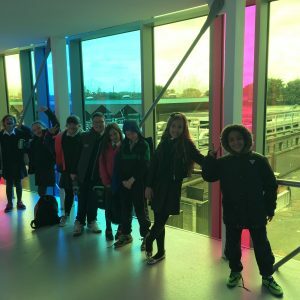 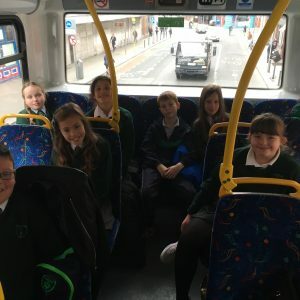 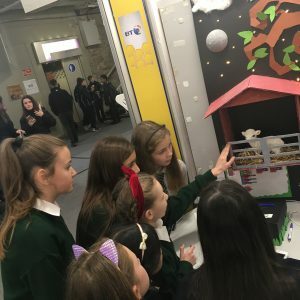 They spent the day learning about other schools projects and explaining their own and presented a video to the whole group which they had made that outlined their project. 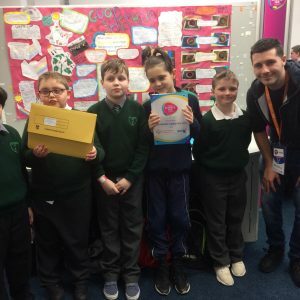 The children were awarded with a plaque for the school for their fantastic efforts. 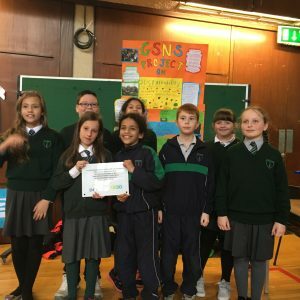 Well done fourth class, you are all Sustainable Superheroes! 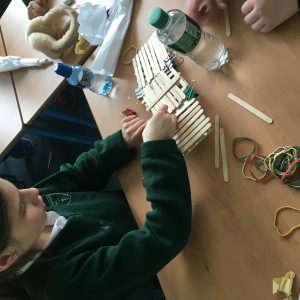 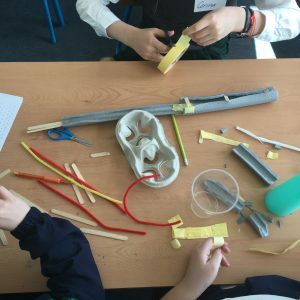 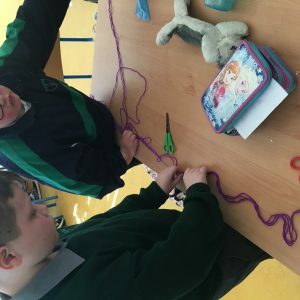 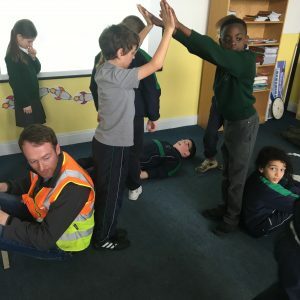 Fourth class are taking part in a 10 week programme called Engineer in a Box. 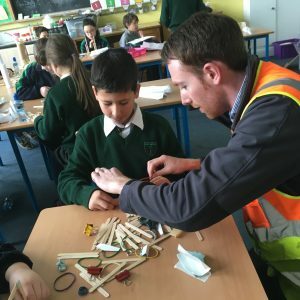 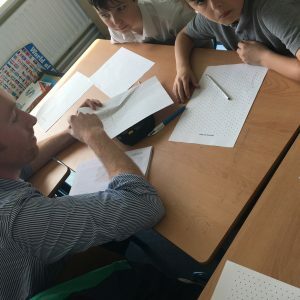 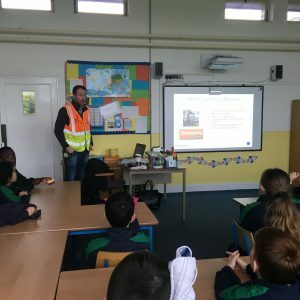 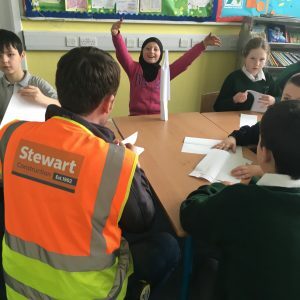 Jerry, an engineer with Stewart construction is carrying out an engineering workshop with fourth class each week. 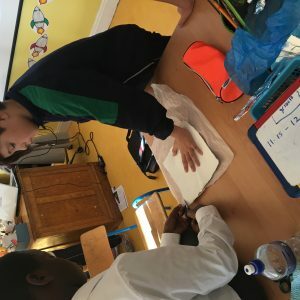 Every week a new member of fourth class will document what they did that day with Jerry. 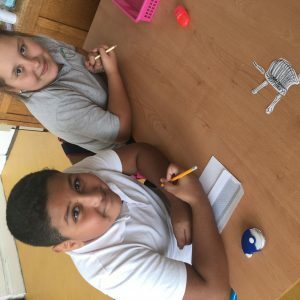 We hope you enjoy our blog. 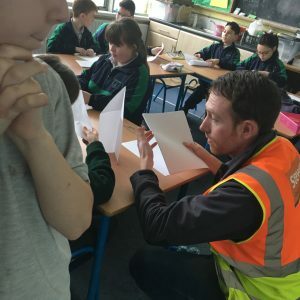 A guy called Jerry came in to us and talked to us about engineering. 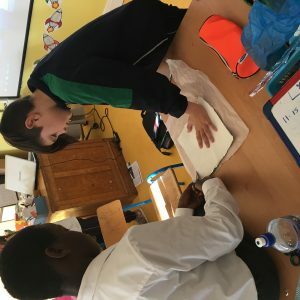 He showed us an introduction video and we all got the basic idea. 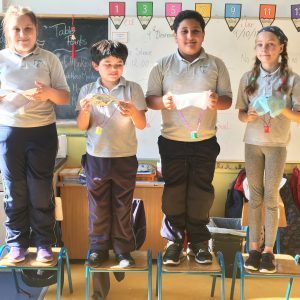 We had to try to make the tallest tower we could out of two pieces of paper. 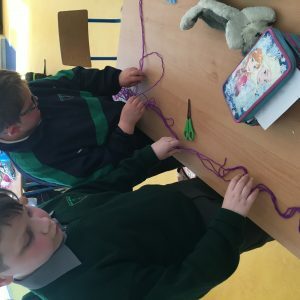 Afterwards we discussed what could have helped us stand it up and keep it together. 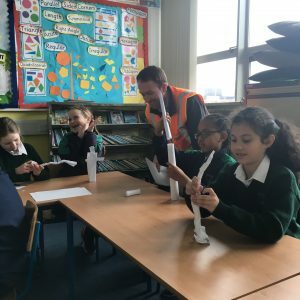 We watched another video about a bridge that fell because it wasn’t built properly. 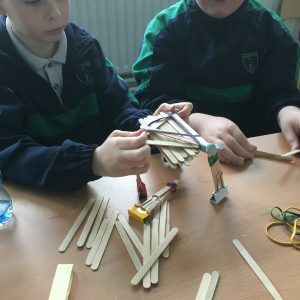 Next we made bridges out of 50 lollipop sticks, elastic bands, paper clips and blu tack. 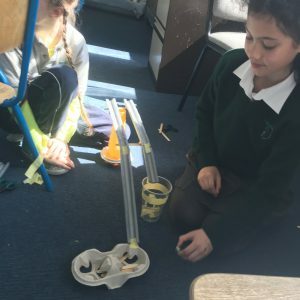 It had to be; free standing, 30 centimetres long and support a 500 ml bottle. 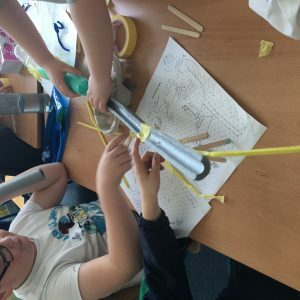 It wasn’t easy but Jerry said we did good attempts because the bottle didn’t break the bridge. 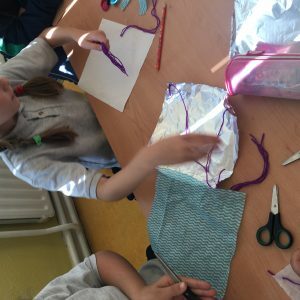 We can’t wait for our next lesson! 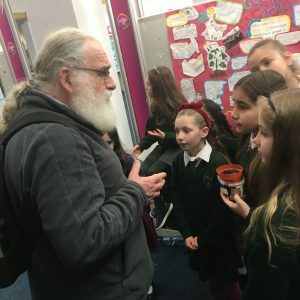 On Wednesday Jerry came to see us. 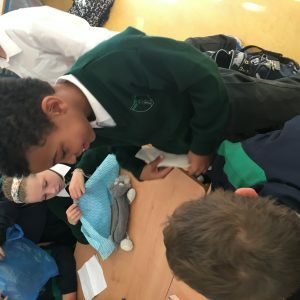 He was talking to us about sweet factories! 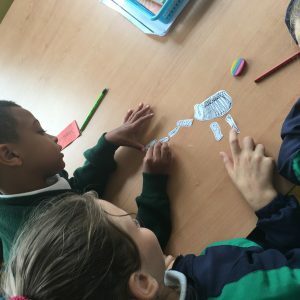 We drew our factories on IOS paper. Then we had to make it! 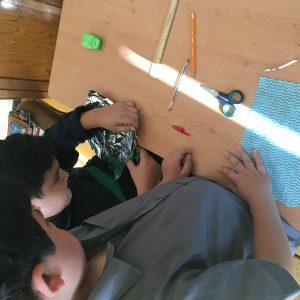 He gave us materials to make a 3-D candy factory. 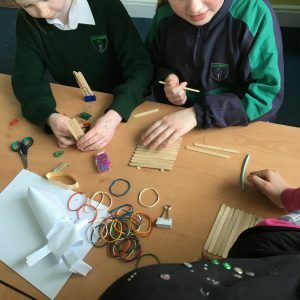 We used all sorts of things such as marbels, tape, plastic cups, tubes and pipe cleaners. 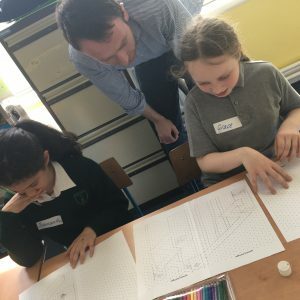 Our aim was to get a marble from the beginning into a cup at the end, with a turn along the way. 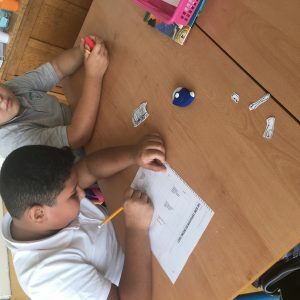 We attached everything to get the marble into the cup. 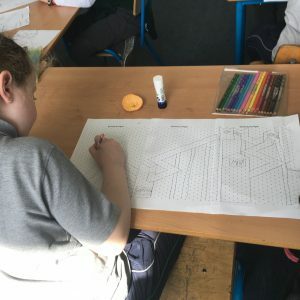 It didn’t always work on the first go so we had to change our design until we were successful.